Owing to a long-term destination for our business, we are engaged in offering a wide gamut of Hydraulic Seal. 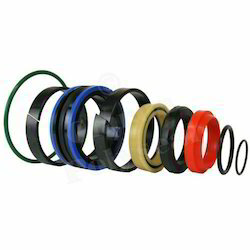 Broadly use in applications like hydraulic cylinders, these hydraulic seals is examined by our quality experts on various provisions of quality in order to deliver flawless range. The offered hydraulic seals are manufactured using finest quality materials in compliance with international quality standards. We provide these hydraulic seals in various specifications for our customers to choose from. Looking for Hydraulic Seal ?